Officers continue to investigate at Barns Green level crossing following a collision between a train and a car which killed two people this morning, a spokesman confirmed. 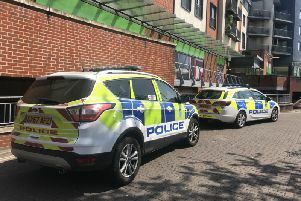 Officers from British Transport Police were called to the scene at 8.47am to ‘reports that a car had been struck by a train’, a spokesman confirmed. A 15-year-old boy and 72-year-old man sadly died in the collision, the spokesman said. Their family is being supported by family liaison officers, confirmed the spokesman. British Transport Police officers remain on the scene this afternoon. A spokesman from Billingshurst fire station tweeted: "Our thoughts are with the family and friends of this tragic incident. "Crews spent many hours on scene but are now back home. "Well done to all emergency staff involved. "A very sad day for the community of Barns Green." Anyone with information which could help the investigation is asked to get in touch with officers. The Rail Accident Investigation Branch have been notified of the incident, the spokesman confirmed. Community volunteers helped assist some of the estimated 100 people left stranded at the station after the collision. Paul Berry tweeted: "Hats off to the Barns Green community for pulling together so well after today's terrible event." All rail lines have been blocked between Horsham and Pulborough due to the incident, with disruption expected to last for the rest of the day.